*Dilly Dolls*: New stuff dollies!! That's right, Oriana has been busy again and has more new releases for you. First up is the Spring Bloom Doll Key. There are two versions of this key, a simple decorative one and an interactive one. Right now you can get the decorative version for FREE as it is Orianas' hunt giftie in this months Dolly Dash hunt. This is a monthly mini-hunt organised by the Dolly Dash group, of which Oriana is one of the owners. This hunt ends today 1st May, so hurry if you want to snag this up for free!! Next, the interactive key. This is the same key, however it has the added fun feature of allowing others to interact with it and wind it up!! This version will be available at the Guild of Gloom Carnival Sinistre when it opens later today. Next up are these absolutely gorgeous Dola Overbust Corsets. These have a beautifully detailed lacey texture and are completed by corset ribbon laceing, finishing with a pretty bow on the reverse. These are available in 8 colours and 2 versions; one which has the lacey texture all the way around, and one where the side panels are without lace, but coloured to match. These are also going to be available at the Guild of Gloom event. Oriana has also made one in an exclusive colour which will ONLY be available at the Guild of Gloom, 100% of the profits made from this will go towards the Sophie Lancaster Foundation. 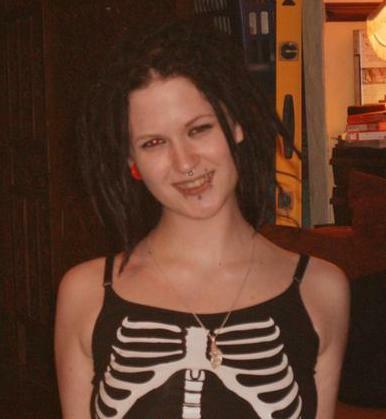 Sophie Lancaster, off course, was the young goth girl who was attacked, along with her boyfriend Rob Maltby, for being dressed as a goth. Sophie bravely shielded Rob to protect him from the brutal attack. Rob survived the attack, but Sophie lost her fight for life in the hospital. The Sophie Lancaster Foundation aims to create more awareness of these kinds of hatecrime and to stamp out intolerance towards people from alternative subcultures, and to have the UK Hate Crime legislation extended to include people from “alternative subcultures” or “Lifestyle and Dress".